Mayor John Tory's executive committee unanimously approved the new scaled-down SmartTrack transit proposal on Wednesday - hours after Tory said it is better than the version he pitched on the campaign trail. Mayor John Tory's executive committee unanimously approved the new scaled-down SmartTrack transit proposal on Wednesday — hours after Tory said it is better than the version he pitched on the campaign trail. "The service levels, if anything, are going to be better," Tory told reporters before his hand-picked executive committee voted on the plan. "I'm proud of it and I'm going to fight for it and it's going to happen." The SmartTrack program looks much different than the one Tory campaigned on. The plan initially called for 53 kilometres of heavy-rail service with 22 new stops to be built within seven years at a cost of $8 billion. That number has been pared down to between four and eight new stops, which are expected to be constructed as part of the ongoing GO Transit expansion efforts at an unknown cost to the city. The original plan promised service every 15 minutes along the new SmartTrack, and Tory said Wednesday that will still be the case. 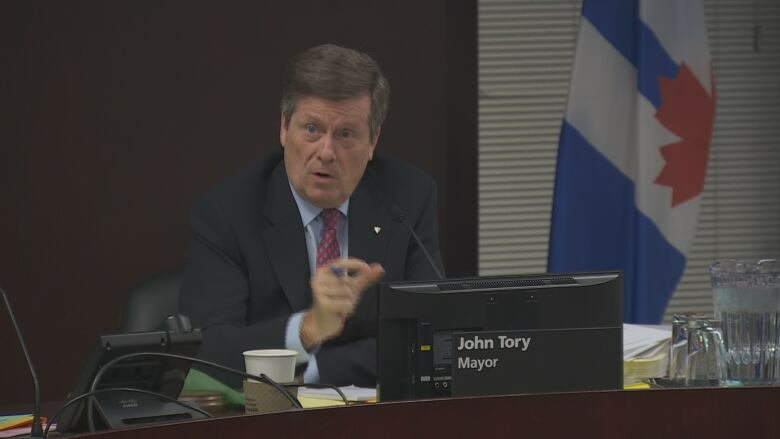 Tory said concessions were necessary in order to craft a plan he can get through city council. "We have to stop defeating ourselves with endless hand-wringing," the mayor said, "We simply have to get on with more transit for Toronto, and I make no apologies for using my energy and determination and policies to make that happen." Tory said it was his responsibility to address deficiencies in the original plan that were outlined in two separate city reports. "We didn't have endless amounts of money or experts available to us during an election campaign," he said. It's not yet clear how much the project will ultimately cost or how the city plans to pay for SmartTrack. The federal government has committed $2.6 billion towards the project — one third of the original $8-billion price tag. Executive members also unanimously endorsed a pared-down version of Tory's Scarborough transit plan. During his election campaign, Tory promised to build the three-stop subway in Scarborough from Kennedy Station to Sheppard Avenue, which council approved before he was elected. It was supposed to replace the aging Scarborough RT. But facing a revolt at city council, Tory shifted in January to a one-stop subway extension to Scarborough Town Centre and a 17-stop light-rail system along Eglinton Avenue East to the University of Toronto's Scarborough campus. "The vast, vast majority" of Scarborough councillors support the changes, Tory said. But some councillors who represent downtown wards aren't buying Tory's defence of his plan. "The year we just spent studying the original SmartTrack proposal and finding out it wasn't possible is a wasted year," Ward 14 Coun. Gord Perks said. Coun. Mike Layton, who represents Ward 19 in Trinity-Spadina, said transit planning in Toronto has become too politicized. "We have to start having a mature conversation about transit in this city based on facts and not political promises made during elections," Layton said. The city also plans to move ahead with a downtown relief subway line that will start at Pape Station, but the mayor has repeatedly stressed this is a long-term project that could take 12 to 15 years to get off the ground. The new transit plan is expected to go before city council in June.